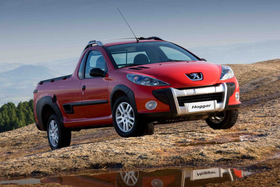 The Peugeot Hoggar pickup was the first model developed by PSA in Brazil for the local market only. PSA/Peugeot Citroen plans to double its production capacity in Brazil to 320,000 units in the next two years. The French carmaker plans to invest 580 million euros (about $780 million) by 2012 to boost production in South America's largest market. New-car sales are booming in Brazil. Analysts expect volume to grow 3 percent to 2.6 million units this year on the back of six years of fast growth. Brazilian car sales have more than doubled from 1.17 million in 2003 to a record 2.53 million last year. Last year, PSA sold 147,690 cars in Brazil, equivalent to a 5.8 percent market share, a figure the automaker aims to double by 2012 as part of its strategy to internationalize and reduce its dependence on the saturated western European market. PSA is the fifth largest carmaker in Brazil where Volkswagen AG and Fiat Group Automobiles S.p.A. with 633,442 and 631,468 unit sales respectively last year dominate, selling half of all new cars bought by Brazilian buyers. Brazil also represents huge profits for some European automakers. Analysts estimate Brazil delivers annually about 1 million euros in operating profit for Fiat's automotive division. Brazil also accounts from 15 to 20 percent of VW group operating profit. PSA does not break out numbers for Brazil, but Varin told investors in February that rebuilding profitability in Brazil was one of the company's key objectives for 2010. PSA's automotive operations last year widened their operating loss to 1.26 billion euros from a 225 million euros loss in 2008. PSA will use the new Brazilian investment mainly to develop new Peugeot and Citroen vehicles and new engines for the local market and to increase production capacity by 50 percent at its Porto Real plant. The plant currently has annual capacity for 160,000 vehicles and 220,000 engines.